At the corner of Sushi Gen and Aloha Cafe at 2nd/Central in Little Tokyo, downtown Los Angeles. 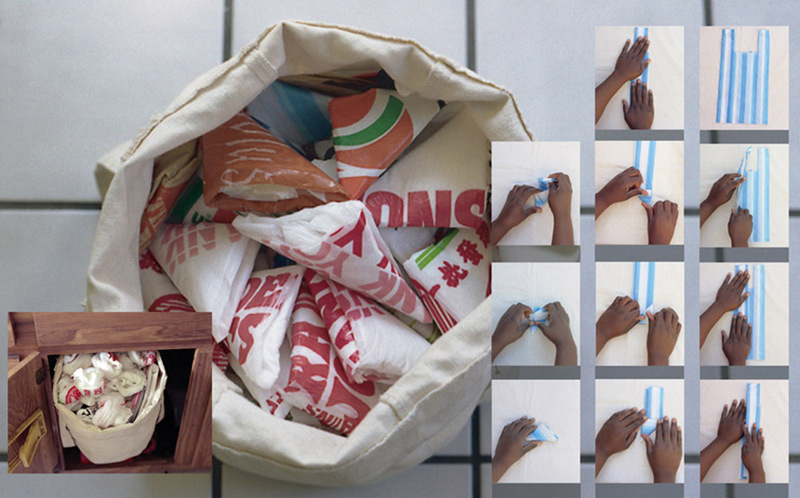 This is a remixed version of the first photo in the (SOME OF) My inheritance series (below) - how to fold a plastic bag into a triangle learned from my mother. My proposal, where I answer the questions: What is your vision and intent? How does the rendering represent Little Tokyo? Why is public art important to you? Background and connection to Little Tokyo, can be read here. The 'Inheritance' series is an ongoing series of 'how to' instruction photographs that began in 2007. The goal was to create photographs that viewers could literally 'take something away from.' Thematically the project is inspired by UNESCO's intiative to preserve intangible cultural heritages worldwide, but of course on a much smaller, mundane scale. Here the pieces of cultural treasures being preserved are everyday actions (folding, counting, measuring) that have been passed on over casual conversations between friends, family, and travelers. The ongoing project is indicative of my interest in people, the cultural beauty and significance of what they know, and the transmission of that knowledge. 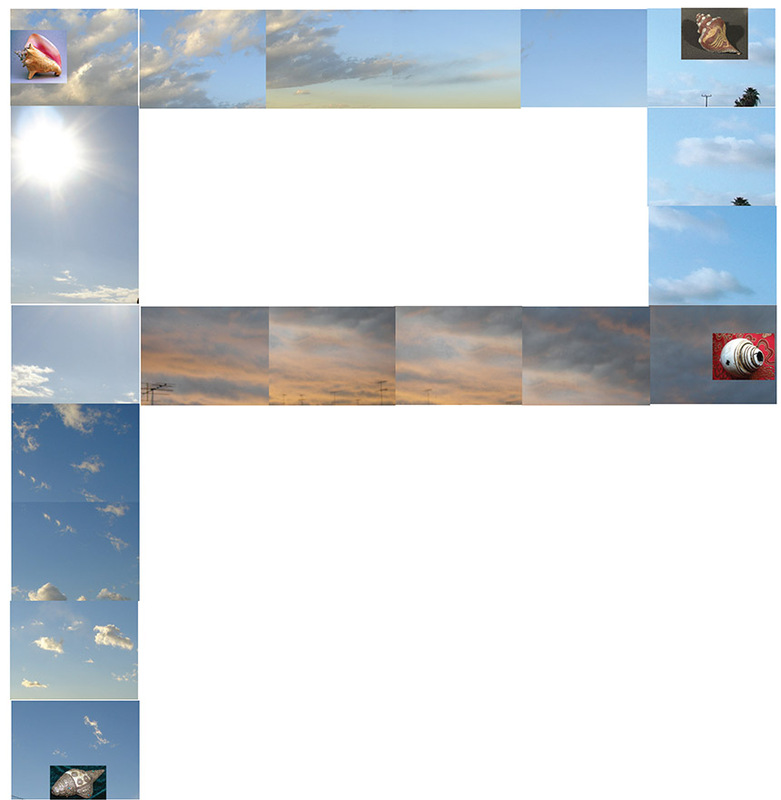 To date, there are 8 photographs in the series. 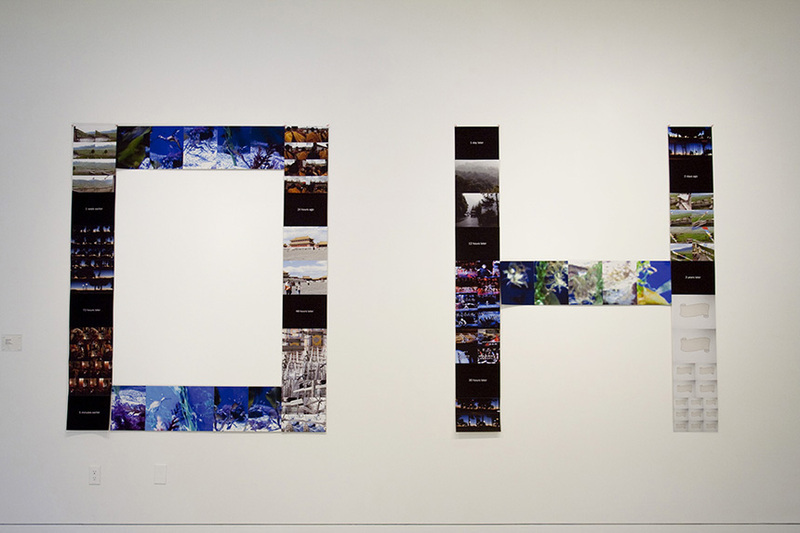 O H is comprised of 51 inkjet prints, the vast majority of which are stills pulled from video clips shot in Los Angeles, Kham- Tibet, Beijing and Chengdu- China, and the Long Beach Aquarium. O H is a journey back and forth, in a span of minutes, days, hours, and years. What if it was already happening? What if what you wanted was today? Past, present, future in one mind. Tibet, China, L.A., in one body. Amidst the barrage of PEACE and LOVE and I AM (___fill in the blank__) , WE ARE (___fill in the blank___) marketing campaigns, a gentle O H. Quiet lightening. Receding waters. The woman in the bed who blinked in the dark (Chris Marker). The dinosaur who was still there (Augusto Monterosso). Public art commission by the Los Angeles County Arts Commission / Los Angeles County Fire Department. The series of 17 photographs takes as its inspiration and subject matter the Los Angeles County Fire Department- its history, contemporary fire fighting practices, and fire culture overall. After a brief yet illuminating immersion into County Fire, the strongest impression I came away with was the tremendous orderliness, cleanliness, precision, diligence, and discipline of the fire fighters in their daily practice, work environment, and disposition. This was in stark contrast to the absolutely unpredictable timing and nature of the incidents that they would be called to serve. As a civilian free to flounder in the everyday chaos of my everyday life, I was stopped in my tracks to witness the steadiness with which the fire fighters conducted themselves and maintained their environment (amidst a lot of joke and laughter). Organization and an even mind meant speed and safety. Maybe even the difference between life and death. With this in mind and using the many engineer's maps around the station and in the rigs as inspiration, I decided to use the grid as a symbolic aesthetic to organize the un-organizable; to chart the seemingly un-chartable. 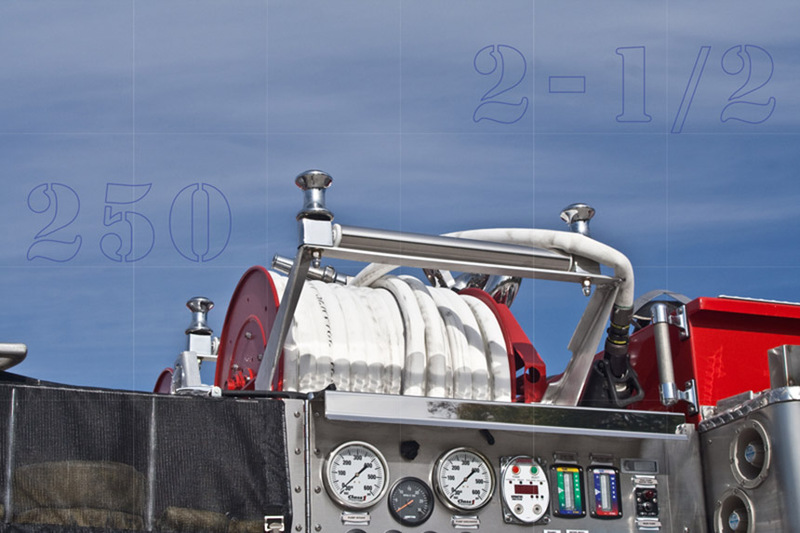 Each image in the series therefore is overlaid with a grid; representing the calm organization of fire fighters and their practice. 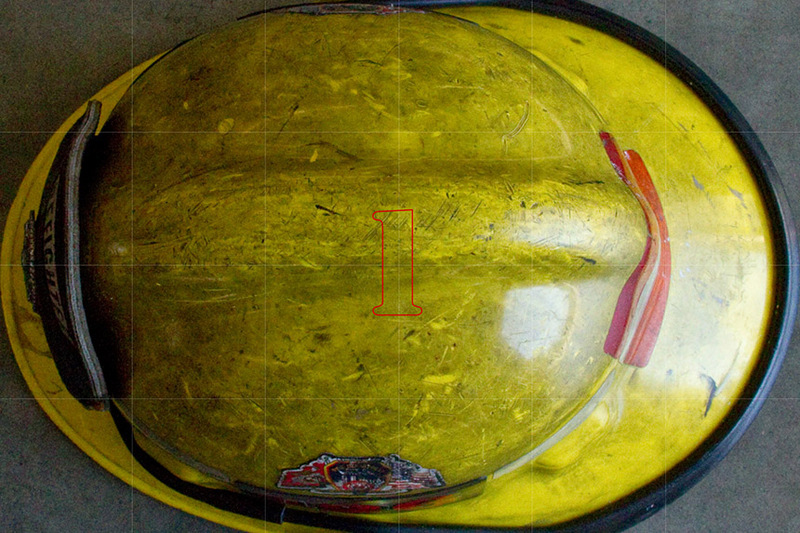 The stenciled numbers are borrwoed also from the engineer's maps as well as the stenciling that can be found on all fire equipment identifying which rig the piece comes from. All numbers relate back to an aspect of fire culture, practice, and/or history. The works serve as a fun puzzle for patrons visiting the fire station while also serving as launching pads for fire fighters to speak further about aspects of fire culture. 7' high letters made from 8-1/2" x 11" inkjet prints A tale of meditation, reflection, and reconnection during a period of unexpected rest due to injury. 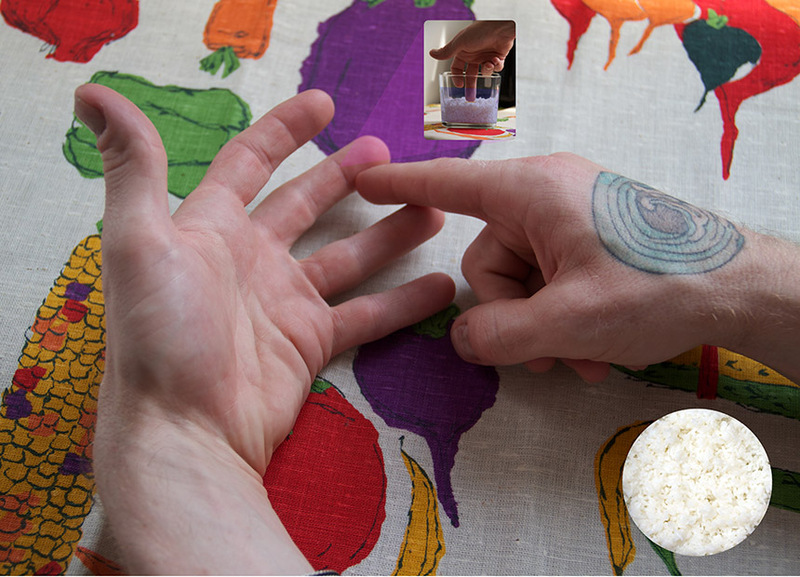 The tale is told in 5 acts through a combination of video stills and photographs. P / Invocation, A / Supplication, U / Reflection, S / Inspiration, and E / Dedication. The letters were originally made specifically for a set of windows on the bottom floor of an apartment complex in Pasadena, California. 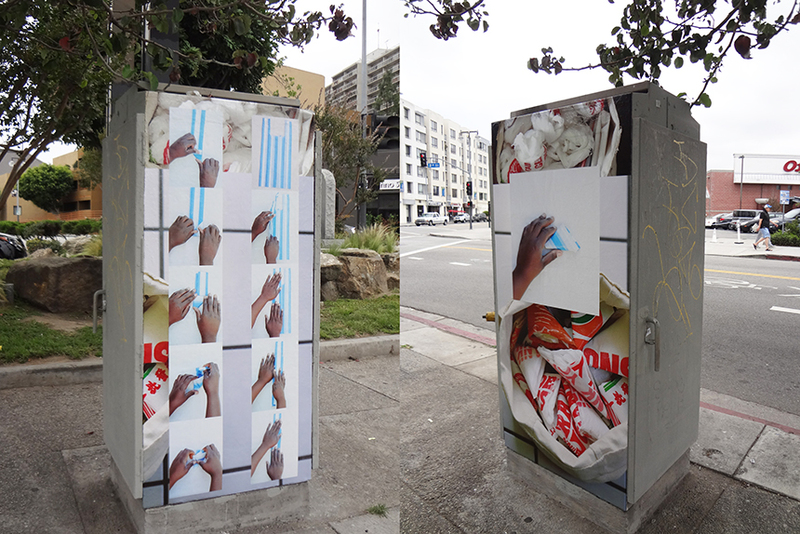 From afar, pedestrians were able to see the giant word "PAUSE," and up close people were able to read the images as the text of a story about reconnecting with one's own values and inspiration. 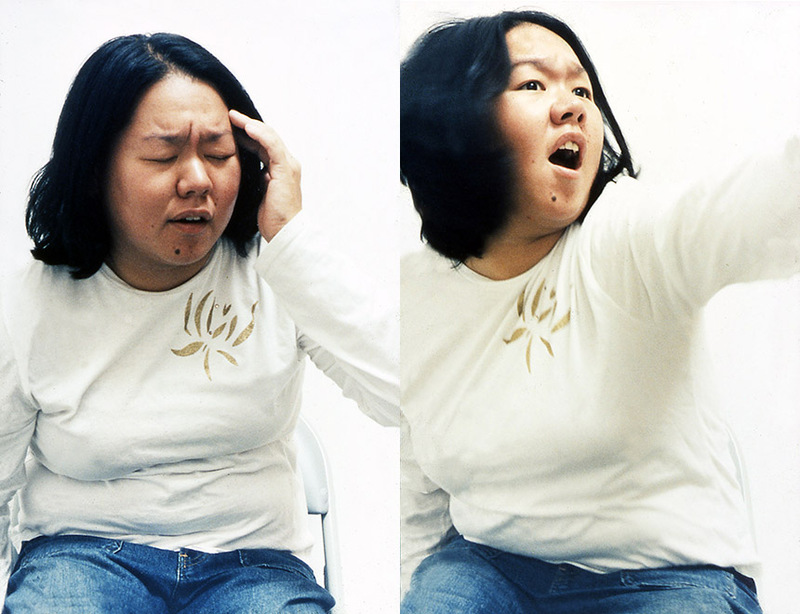 C-prints, 20" x 16" each A series of eleven portraits, each entitled with the name of a popular female T.V. character. The images document the moment of invocation of these characters. Make-up and costume are unnecessary, location is neutralized; this allows for the embodiment and expression of these women, which include Buffy, Xena, Scully, Ally, Cordelia (above left), Willow (above right) and Lois among others. They are all in me and yet I am nothing like them at all. C-prints, 16” x 20” each A series of five portraits of various people involved with the L.A. River Water Temple Project, a public art project which was to be built at the site where the Los Angeles River begins at the confluence of Calabassas and Bell Creek in Canoga Park. 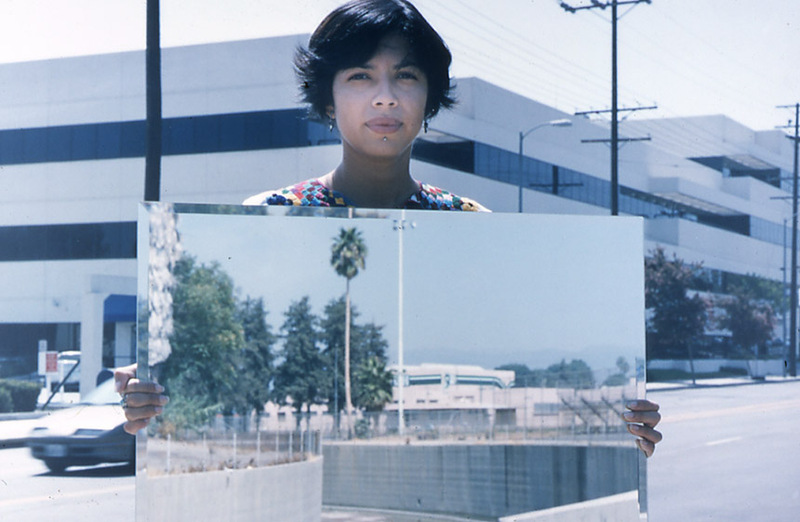 Using the area around the beginning of the L.A. River in Canoga Park as a palette, each participant was handed a large mirror and was asked to reflect a portion of the Los Angeles River Temple site that spoke to them. 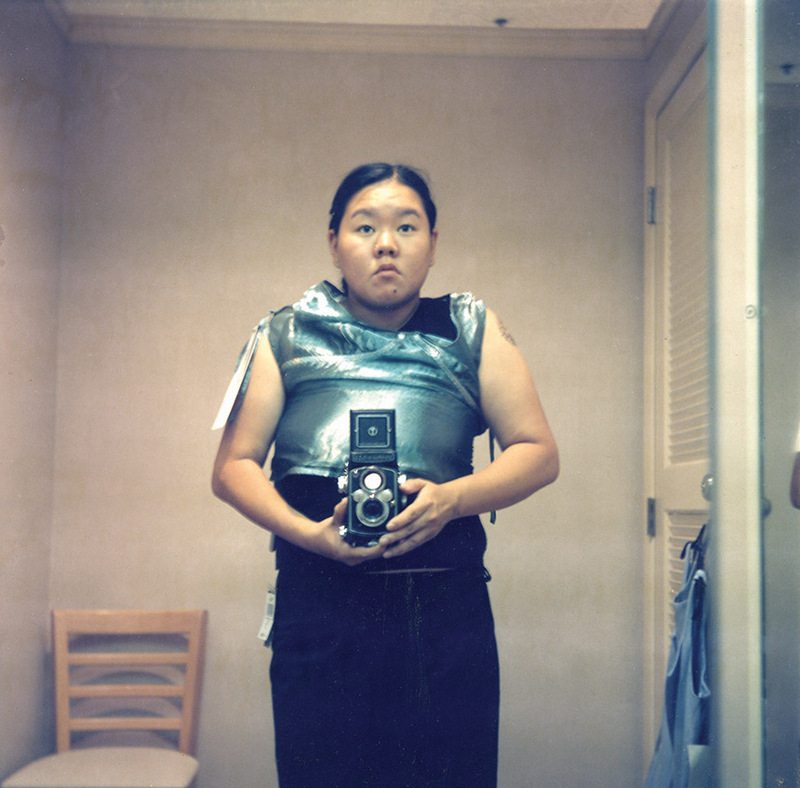 C-prints, 11” x 11" each A series of twelve self-portrait photographs shot inside various store fitting rooms. Perhaps the ‘instruction piece’ would read something like this: Go to a department store. Take a camera with you. Pick out clothes you really like. Try them on in the fitting room and strike a pose. Look into the mirror. Keep looking and keep posing until you fit in. Take a picture. 27 stereoviewcards, 3-1/2" x 7" each A series stereoviewcards depicting scenes taken from Japanese manga. When viewed through a stereoscope, within each scene, a character emerges in three dimension~ a tennis player in the throes of a match, a young girl running home through a dark forrest, a high school girl sharing a tender moment while walking home with her friends...3cm is an album of memories of Japan which are strongly informed by the artist’s love of manga. Just as the doubled memory of a real life Japan along with a manga memory of Japan co-exists only within the artist’s mind, the three dimensional character only comes to life when viewed through the stereoscope. Both are real and dimensional, but only when viewed through a particular lens.